With my Openstories hat on I'll be taking part in a panel discussion at the National Association of Literature Development conference, The Space Between Us, in London next week (still tickets if you hurry). Really looking forward to talking over the many changes happening in the field of literature development, and the evolution of blogging, online publishing and creative writing websites such as Rainy City Stories and The Real Story are right at the centre of these changes. But there's also the new forms of experimental literature happening on new platforms/devices, the self-publishing revolution, e-books and a host of other changes to talk about. It's an exciting time for readers and writers. Also, I'm running another session on The Art of Blogging at Cornerhouse on 17 April at 6pm. This will be an informal, conversational session (rather than a lecture) so places are limited. We'll be sharing tips on developing a writing style and identity for your blog, finding the right platform, building an engaged community of readers and getting your posts to a bigger audience among other things, and looking at some particularly successful blogs in detail. It will be suitable for new and more experiened bloggers alike. Please note though that this will not be a hands-on "how to start a blog" session; Cornerhouse runs separate beginning to blog sessions that cover the nuts and bolts. If you're interested, be aware that events in this series tend to book up very quickly. 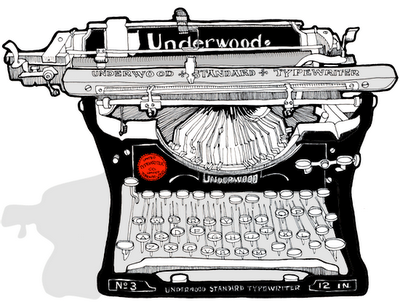 Underwood illustration from the amazing Le Pen Quotidien. This sounds good, so I think I shall attend thank you very much. Is leaving comments on other people's blogs, like I am doing here, a good way of getting other people to follow your own? Or do I have to wait until I've paid to get that kind of info? Anyway, if you follow my blog, I will have two followers, which is the same amount that Harry Potter had in the films they made about him (they were called Ronald and Hermione and they ended up kissing on the mouth). Anyway!